Remove your old vent and install your Keen Home Smart Vent as demonstrated in our setup video. Yank the pull-tab from your batteries, close the cartridge, and watch for your LED to double-blink green. This indicates the vent is attempting to find a hub - your hub. In your Wink app, select ‘add sensor.' Navigate through the steps to add a new ZigBee device. 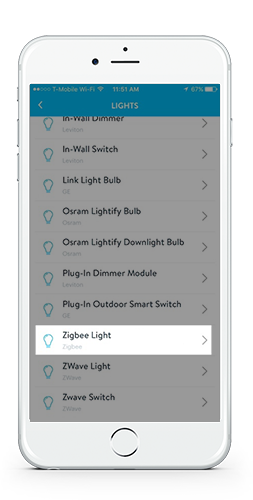 Under “Lights,” choose ‘ZigBee Light Bulb’ from the list. You’ll come to a screen that indicates it’s trying to pair. It won’t actually yield a ‘success’ message, so give it about 30 seconds and then close back out to your Wink’s home screen, or let it time out. There you should see the new ZigBee bulb listed, where you can change its icon and name accordingly. You'll be able to use it just like a dimmer.